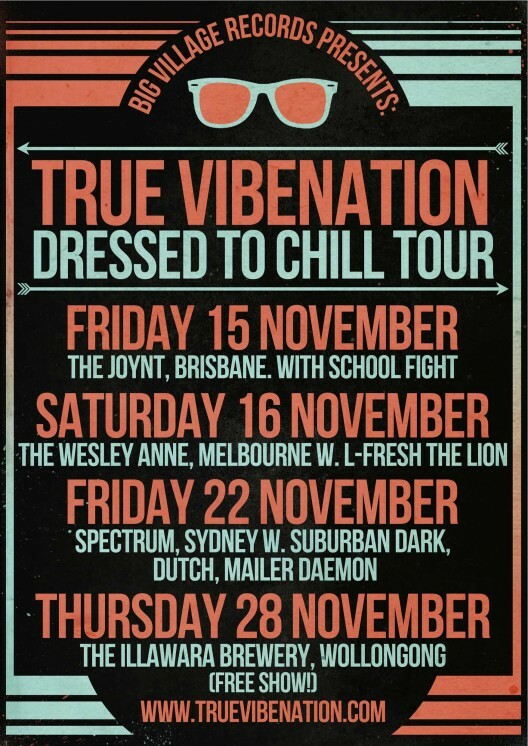 Sydney hip hop rising stars True Vibenation take to the road on the Dressed to Chill Tour to launch the first single from their upcoming second LP. With each member playing horns as well as handling writing and production duties the trio goes beyond the traditional hip-hop format of two turntables and a microphone to transform into a blasting horn section and live beat making band. Coupled with their self-made instrument that literally turns audience members into drum machines their live show is something that has to be seen to be believed. After completing the ambitious guerrilla art/music project True Vibenation were straight back at it and before the concrete had even dried on the USBs they returned to the studio to work on the follow-up to their first album ?The Sunshower Phenomenon?, released through Big Village Records in October 2011. With an ever-growing fan base, tight live show and a penchant for hard work True Vibenation are a group with a bright future in Australia?s evolving hip hop landscape.